Designed for commercial automatic door and gate operator applications. This transmitter can operate multiple receivers connected to multiple operators. 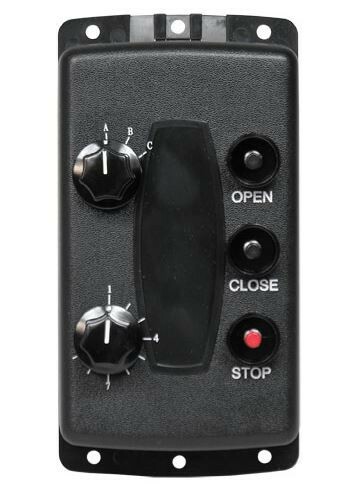 The transmitter has three buttons for Open, Close, and Stop commercial operator functions and two rotary switches to select which receiver/operator to control. The three operation pushbuttons have a surrounding bezel to shield them from accidental activation. The Stop button is colored red for easy identification. 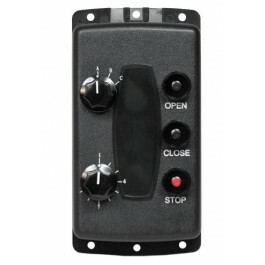 Up to 27 3-channel commercial door or gate receivers can be independently controlled by this transmitter. Compatible with 831R-288RF, 831RJ-288RF, MVP-3CH-24V-3T-4W-288RF, MVP-3CH-12V-8W-FC, and MVP-RE-288RF-24V-8W-FC 3-Channel receivers used in Open, Close, Stop applications.